Comic Books very much like Movies until quite recently have often been set aside as a minor popular art forms never quite achieving the respectability of other more noble artforms like painting, poetry, music or sculpting to name a few. It was probably thanks to Pop Art and its spearhead artists like Andy Warhol or Roy Lichtenstein and even to some degree former Iranian diplomat Fereydoune Hoveyda that academic interest for such masters of the genre like Herg�, author of Tintin Adventures, and his colleagues who invented what became known as the French and Belgian Ligne Claire School Style truly started. Other styles have since appeared and showcased at various festivals like the prestigious Festival d'Angouleme, and obviously the American Comic genre has distinguished itself while having its share of influence with Disney heroes or Super Heroes like Superman and Batman. 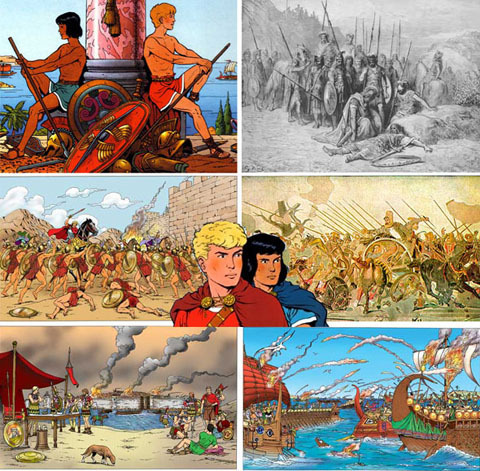 Interestingly in recent years particularly the past two and a half decades French Comic books have also tried to shed light on middle eastern civilizations and particularly Persia. This has been maybe due to the past colonial history of France or Belgium that were also penetrated by Oriental imagery and Mythology due to contacts with the Muslim world and their own rivalries with other Colonial Powers like Great Britain or Germany. French Kings, President, diplomats, writers and voyagers were to travel to Persia and vice versa. 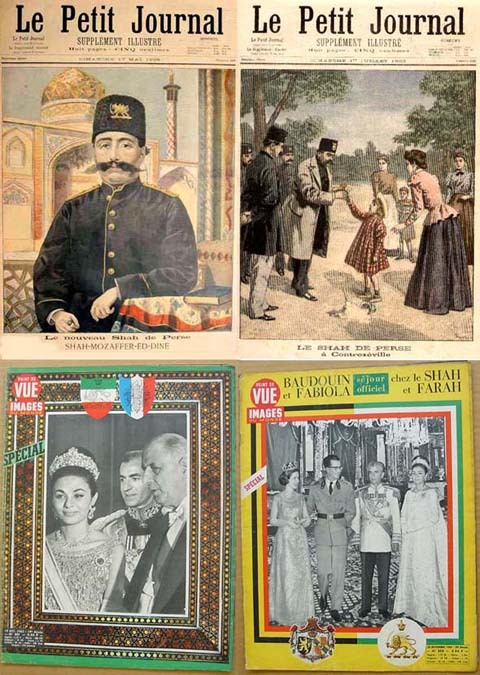 Napoleon and De Gaulle were widely admired in their time for their spirit of independence by Iranians/Persians and continue to be referred to as great leaders who respected Persian culture. General De Gaulle was particularly impressed by a State visit he made to Iran in the 1960's during which he was to inaugurate the building of a modern extension to the old Razi school. ( See Author's notes). Maybe some of this cultural and historical interaction including even the Islamic revolution that took root in France's Neuphle Chateau could explain some of this mutual fascination or curiosity which has had its effect in the graphic artform of French and Belgian comic books. Interestingly in recent years Marjane Satrapy has turned into a French cultural icon since the publication of her comic book series Persepolis that explores not only the life of a school girl caught in Pre and Post Revolution Iran but also confronted to a culture clash with Western values and culture in an interesting and intellectually challenging way while remaining true to a very personal and simple style very much influenced by the French Belgian Ligne Claire. 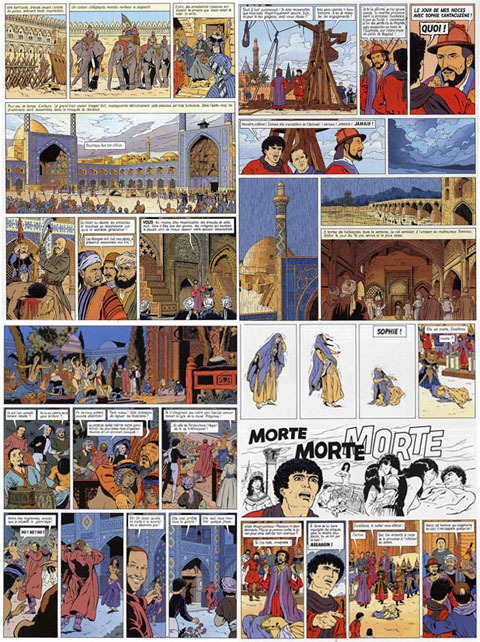 In addition and already prior to Satrapy several French pioneers of the French and Belgian Comic Book arena have tried to explore Persian Culture and History through recurrent adventures. This has been the case of two major icons of the French Belgian school of Artists like Jacques Martin who collaborated with the Great Herg� author of the cult Tintin Adventures and Gilles Chaillet who in turn worked with Martin on his Alix hero. Below are some of their recent works that have focused on two different era's in Persian History, that of Alix in Ancient Persia and that of Vasco a Medieval knight whose adventures lead him to Medieval Persia. Each in their way have been based on meticulous historical and social research that make the adventures if not factual at least authentic for any reader interested in Persian Pre-Islamic and Post Islamic History. Plot: Persepolis in all its splendor: The Apadana, the Hall of a Hundred Columns, Naghsheh Rostam and Pasargardae are only some of the splendid locations that are recreated by Jacques Martin. We are invited to discover what if felt like to live at the time of King Darius and Xerxes not only amongst the nobility but amongst the inhabitants of the great city. The splendid drawings are supported by a historical information and documents that are accessible for all readers young or old. with no particular plot but are purpose but to present Ancient Civilizations and historical Characters regardless of chronological Time and Space. at the time of Bahram Gur when P�rsia and the Byzantine Empire were rivals. Plot: 14th Century Europe and Persia: Uncle Tolemei, banker is terribly angry ! To think that they dared to disturb his nephew who was about to participate at the Palio Race ! These Byzantines have no manners ! As far as Vasco is concerned he only thinks of winning the race. But Destiny will decide otherwise ! All these intrigues and much more will await you in this album. Vasco will undertake a perilous journey marked by battles, fears and alliances that will challenge the heroes from Sienna to Persia and Jerusalem. Once Again Gilles Chaillet offers us magnificent and precise reconstructions of the splendid medieval towns of Shiraz and Isfahan. The life and customs, religious and political intrigues and mindset of that distant era come to life. Sienna of the 14th century A.D. in all its opulence of architecture and costumes contrast with the arid climate and landscape of Palestine leading us to the court of Persia and its treasures. The drawings prove once again of the author's desire to combine an in depth historical research with a good story supported by the splendid coloring work of Assistant Chantal Defachelle. 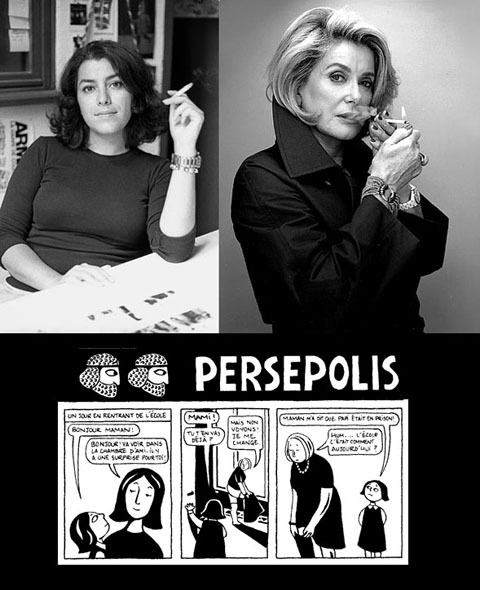 First printed by a little known French edition l'Association, Marjane Satrapi's French Comic book Persepolis has achieved cult status ever since its publication. Widely translated in several languages it remains censored in Persian because of its subversive and outspoken plot. The Album series have been followed by other adventures of Satrapy and Family with such stories as Embroideries and Poulets aux Prunes exploring issues as taboo in Iran as female sexual pleasures and Freudian obsessions of the author. Most recently Satrapy has published Sagesses et malices de la Perse and Adjar. Persepolis will also be a much expected animated movie in 2007 starring Catherine Deneuve, and daughter Chiara Mastroiani in the respective title roles of Mother and Daughter Satrapy. If unlike Greek, Roman or Egyptian civilizations, Persia remained to some degree mysterious or unreachable for the Western Mindset, these recent examples prove the ability that a so-called minor artform like comic books has to visually educate us on other cultures and ours in particular. It is not surprising that cinema in turn has been exploiting this artform thanks to Storyboards that have been widely used by the Spielberg and Luc Besson ( both great admirers of Herg�) generation of filmmakers. 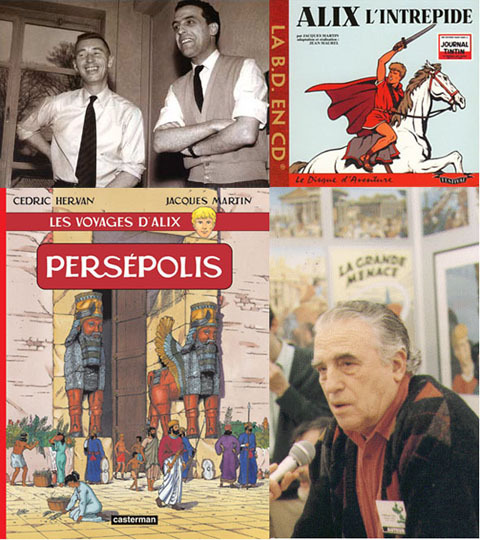 It should be noted that unfortunately non of the Works of Jacques Martin, Gilles Chaillet or Marjane Satrapy have been translated into Persian. Maybe it is high time to consider this possibility be it by Persian language publishers outside Iran in a near future until the same can one day be done back home in our country Iran. All Comic books are available on amazon.fr . 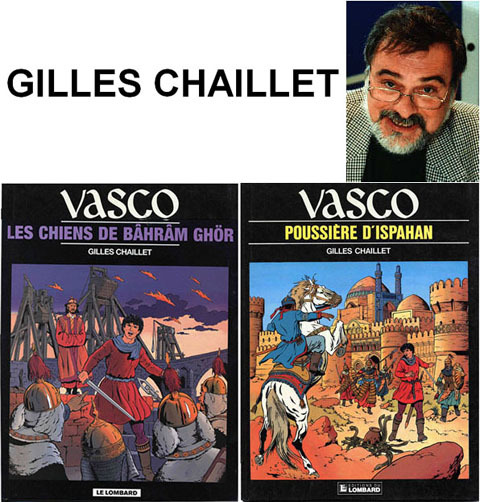 However Vasco and Alix unlike Satrapi's Persepolis or Herg�'s Tintin are not available in English. (**) Long Live French Persian Friendship !